Civil rights advocates file nationwide class action lawsuit on behalf of 100+ refugees detained by ICE. ​Posda Tuot, cousin of Nak Kim "Rickie" Chhoeun, who was detained by ICE on October 20, 2017. 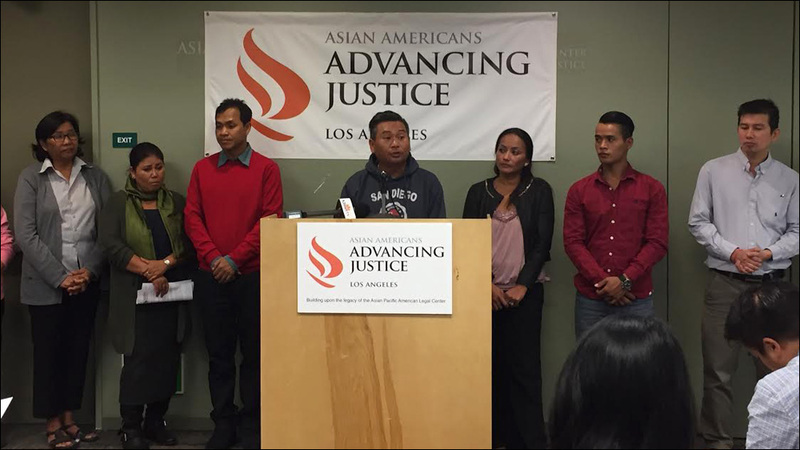 Cambodian refugees detained in recent raids by Immigration and Customs Enforcement (ICE) have filed a nationwide class action lawsuit challenging their unlawful arrests. Since early October, ICE has rounded up over a hundred Cambodian refugees with deportation orders, making these the largest raids ever to target the Cambodian community. Nearly 2000 Cambodian refugees are at risk of being unlawfully arrested. The complaint, filed last Friday by civil rights organizations Asian Americans Advancing Justice - Asian Law Caucus, Asian Americans Advancing Justice - Los Angeles, and Sidley Austin LLP, alleges the detentions are illegal, and argues that without that clear pathway to deportation, the detainees should be released. In the U.S., Cambodian refugee families struggled with trauma and poverty in violence-ridden neighborhoods. Some refugees made mistakes in their youth, which led to criminal convictions and ultimately deportation orders. But because Cambodia has refused to accept them for deportation, ICE had to release Cambodian detainees instead of keeping them indefinitely and unconstitutionally detained. "I have worked hard to support my family and give back to the community." Since their release, in some cases decades ago, these refugees have returned to their communities and rebuilt their lives. Many have U.S. citizen spouses, children, siblings, and relatives who rely on them for support. For decades, they have cared for their families and led peaceful and productive lives in their communities. Throughout Donald Trump's presidential campaign, he promised to crack down on countries that have been reluctant to accept deportees. In September, his administration acted on that promise and placed visa sanctions on Cambodia. These recent raids also appear to be a tactic by ICE to coerce Cambodia into cooperating with a U.S. deportation policy. "In the 22 years since my conviction, I have worked hard to support my family and give back to the community," said Mony Neth of Modesto, California, one of the plaintiffs in the lawsuit. "To be suddenly torn away from my wife, daughter, and elderly parents is devastating to all of us." "ICE has traumatized entire communities by re-detaining people with no warning and for no legitimate reason," said Jenny Zhao, Immigrant Rights Staff Attorney at Advancing Justice - ALC. "We demand that ICE release these Cambodian refugees and stop violating the law." without any reason or explanation." "A bedrock principle in our Constitution and laws is that the government may not detain individuals whenever it pleases," said Christopher Lapinig, Skadden Fellow at Advancing Justice - Los Angeles. "With these actions targeting the Cambodian American community, the administration is yet again running roughshod over the Constitution and will do anything, with utter disregard for the rule of law, to advance its xenophobic, anti-immigrant agenda." Nak Kim "Rickie" Chhoeun, a plaintiff in the lawsuit, reported to the immigration office on October 20 -- as requested by ICE -- only to be unexpectedly arrested and transported to a detention facility. Chhoeun lives in Long Beach, California where he has worked as a satellite technician for AT&T for the past fifteen years. "I came to the United States when I was six years old as a refugee from the war. This is the only place I've ever known as home," said Chhoeun. "When I was detained two weeks ago, I felt betrayed and confused. My family and entire livelihood was taken from me without any reason or explanation." Sign this online petition urging the Cambodian government to exercise moral courage against the Trump Administration's bullying and demanding that members of Congress intervene to support refugee families.